Dry and cold weather will blanket the entire Tamil Nadu today. A feeble trough of low is present over Lakshadweep and adjoining area. Fog patches may prevail in many interior areas. The low pressure area in southeast Bay of Bengal has become well marked area and moving in west, south west direction towards Sri Lanka. While the state is heading for a severe drought-like situation, only north east monsoon resurgence in the end of the season would help the situation better. Hopefully state would have good rain in next week from the currently moving system in Bay. Today parts of southern coastal districts such as Ramanathapuram, Pudukottai would experience some rain. 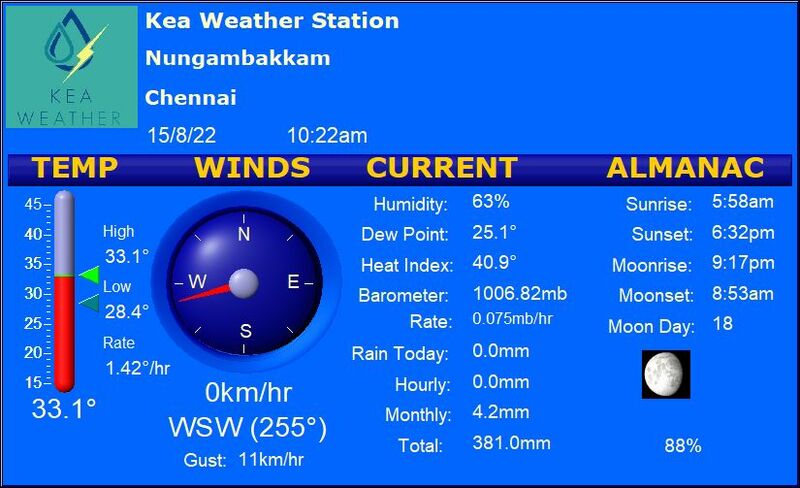 Chennai – Partly Cloudy, pleasant condition with Max Temp of 31 °C. Rain chance is remote. Vellore – Mostly cloudy condition with Max Temp of 31 °C. Light rain expected in the city. Madurai – Mostly Sunny and less humid. Max temp would be around 33°C . Dry and cold weather expected. Trichy – Partly cloudy and warm. Max Temperature would be around 34° C.
Coimbatore – Partly sunny & pleasant. Max Temperature would be around 32 ° C. No rains expected.